Marconi company was born in Milan on 1946 as an Aluminium foundry and specialized workshop for the planning and production of molds for foundries. In the 50’s Marconi company begun to build furnaces for melting Aluminium; at the beginning only for internal use and then, because their excellent performance, also for other foundries. 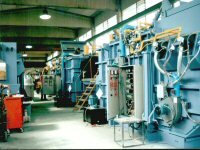 Actually Marconi company is the first Italian manufacturer of Aluminium basin furnaces and one of the biggest in Europe. Marconi was been the first italian company to build their own furnaces with refractory monoblocs instead of the traditional bricks and layers. They are the only company who produce refractory materials inside their factory just to get specifical and different refractory formulas wich means guarantee of excellent melted alloy and long lasting refractory lining. More than 20 agents worldwide allow to the company to be present over many international markets. 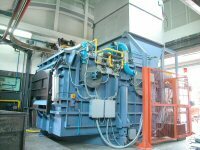 Gas, Gas-oil and electric furnaces.